Behold the devastation brought upon our planet by invading alien forces. 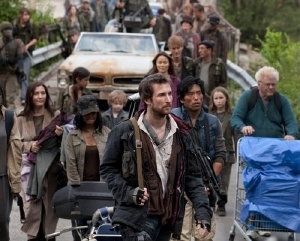 All that's left are Noah Wyle and his band of muted-tones-clad refugees. Check out a bunch of pictures from Spielberg's alien drama Falling Skies, which is coming to SDCC. TNT announced that the Speilberg-produced alien resistance drama Falling Skies is coming to San Diego Comic Con. The show follows a college professor, Wyle, and his band of rebels who are fighting against the Earth's new alien overlords. Moon Bloodgood is also in this new series, playing an orphan therapist. They must all work together to fight the evil aliens â€” which we're hoping will finally be revealed at their SDCC panel on Friday July 23, at 4:45 PM. This looks really bad. I hope it's good. But it looks bland. this sounds interesting. Looks like t here's gonna be a few good shows to start watching. Looking at the photos one thing I noticed was the car and motorcycles are all pre 1970's. Wonder if the aliens used an EMP on us when they attacked us? If they did, these type cars and motorcycles would be the only things running since most everything else would have had their eletronics and computer chips fried. Interesting if this is an on-going theme in the series that the human race's so-called high tech was knocked out early on and now all we have is the most basic of items to fight back with. I hope this is better than his last alien invasion flick War of the Worlds. I still prefer the 1953 version, even if Spielberg&acirc;&euro;&trade;s was closer to the book than the 1953 version. I don&acirc;&euro;&trade;t see anything earth shattering about the photos, this is TNT so this may be a cut above network fare. Taken was really good, also the score was good, but after a while it really lost it's vision. I would say the first 3 dvds were very good. It was a good idea and Spielberg did a ton of research and interviewing of those abducted(claiming) and UFO sightings. This new project might be good. So if the world ends, the fashion sense will be muted colors, but everybody's clothes will be brand new--despite living off the land in harsh survival conditions for weeks, months, whatever--and everybody will be sparkly clean and, with the exception of the lead, clean shaven. It wouldn't hurt TV show makers to give their shows something of a lived-in look. There's nothing wrong with a little dirt. This show looks like J. Crew with guns. @baddog, yeah that's what it looked like to me too, thank God there was loads of shampoo and hairdressers left after the demise of civilization, phew.